How would you like to be the first company vendors think of when selling their house? Maintaining great brand awareness is key – and one of the best ways to do this is through email marketing. AgentPro’s powerful email marketing function makes it easy to create effective campaigns sent straight to your most valuable clients. AgentPro cleverly gathers useful data and information on all of your clients, so when you email them they will only receive relevant information. You’ll have the power to choose which properties to promote and AgentPro will find the clients most likely to be interested in that property. Your clients will highly value your level of customer service, especially as you are providing them with information or offers that are of specific interest to them and not spam or irritating junk mail. Email marketing is such a vital asset to your marketing – particularly in the estate and letting agent industry. Thousands of people search for property every day and they all want something different. AgentPro’s email marketing function allows you to target their specific needs through intelligent client matching. Unlike mass marketing, you can choose an individual customer or a specific group to target. A more targeted campaign will have better results – and you won’t be e-mailing people with properties they have no interest in. As long as you make sure what you send to your customers is interesting and relevant, they will welcome your emails. On top of that, you can get to know your customers by encouraging them to respond and proving to them that you care. AgentPro’s email marketing software has been designed specifically with simplicity and ease of use in mind. If you’ve never done email marketing before don’t worry – AgentPro can help you through every step of the process. You can send an email marketing campaign and judge results almost instantly – particularly in the case of direct response campaigns. So unlike radio or television advertising, you aren’t waiting round for weeks or months to see if your campaign has worked. All email marketing will have your branding professionally applied – from your logo to your colours – and your contact information will be clearly displayed. Every email you send will create an impression of your company – and we’ll make sure it’s a good one. Creating special mail outs to let your clients know the latest news and events is easy. You could show off a brilliant property, introduce a great new member of staff or let your potential customers know about your record breaking sales. We’ve got loads of tools to help – you can upload banners, automatically insert a property’s details, include any text you like and keep your branding completely consistent throughout. It’s quick, easy and effective – and our support team are always happy to help you make the most of it. 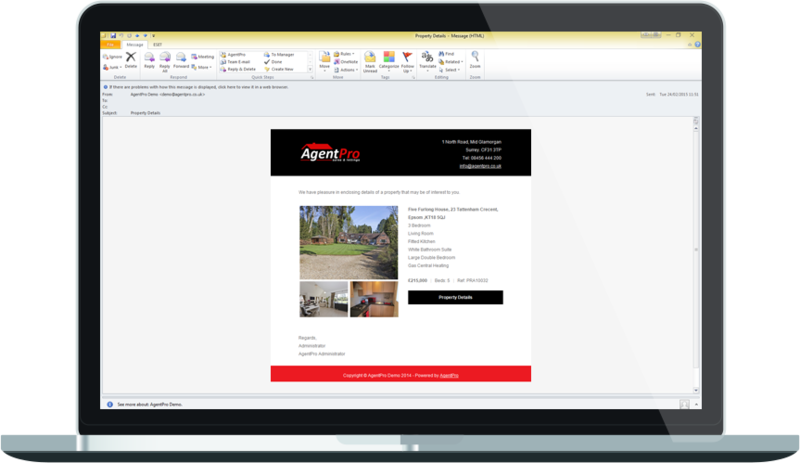 If you’d like to see how we can create eye-catching email designs for your estate agency, please call 08456 444 446 or email info@agentpro.co.uk to arrange your free, no-obligation AgentPro demo.